2, RC, 4, 5, IC. CBS: The men go out on a group expedition, but pointedly leave Matthew behind, leading him to craft a new strategy for survival. A new alliance in the women's tribe thinks it's unstoppable. But when an illness hits Shawna, the power may be back up for grabs. A dispute over chores leads one of the women to assert that she will not work. And while the women face a bare camp, the men celebrate with a feast. Finally, both challenges shown in previews. Seems pretty straightforward: build a fire, burn through a string/fuse, set off some event signaling you've won, same as always. There does seem to be a number of strings for each side, though (eight stakes = six strings? 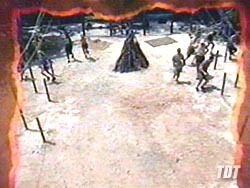 ), and a color-coded, four-tiered structure for each tribe behind the starting lines, to which the ropes are attached. So it could be more complicated than just burning a string. 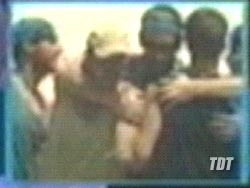 Interestingly, a new TV promo on Saturday showed the guys at this challenge, hugging each other in seeming celebration. So it appears Tambaqui wins this challenge. But the question remains open: is this the RC, or the IC? 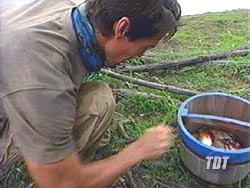 It's not completely obvious which is which, since the immunity idol is not visible (so far) at either challenge. But since fire building is almost always for immunity, as "fire represents life," there's a decent chance this is the IC. 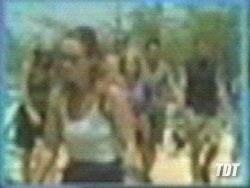 But as VolcanicGlass at SurvivorPhoenix points out, the clothing of the women in this challenge is almost an exact match for the scenes around Jaburu camp where Shawna is crying, and begging to quit. Which also makes sense, since that means she's the one sitting out the Piranha-fishing IC. As further support for a Tambaqui win here, the web bullets says "while the women face a bare camp, the men celebrate with a feast". 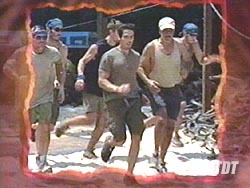 Place this side-by-side with CBS's own press release, up at SurvivorFever.net, which says: "Meantime, a dispute over chores at one camp leads some to assert they will no longer contribute to the camp. 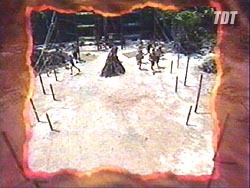 While that tribe faces a bare, dysfunctional living situation, the other tribe celebrates a feast after winning the reward challenge." Together, this says pretty clearly that Tambaqui wins the Reward Challenge. RC pictures: Click thumbnails above for larger versions. Pictures below are actual size, but feel free to click if you feel it's necessary. The start: women on the left, men on the right. Multi-tiered structures in the back. Meanwhile, Christy is just about at the end of her rope, and it's on fire. And the guys all come together for a big hug. Awww. 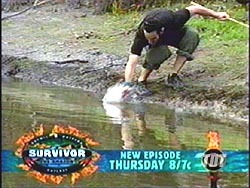 Here we have another challenge described in the pre-Ep1 press, and, like the "mixer" Ep3 RC, this one is described as an immunity challenge (in the same article, even): "The immunity challenges included using piranhas in the Amazon River. 'They're a big part of the landscape; we wanted to use them,' [Probst] said. 'You find a way that's safe for something that's inherently dangerous.'" Surprisingly, this one actually looks like it is the IC (wow, one-for-three, not bad). Presumably the challenge is a simple race to catch a certain number/ volume of fish. Since Matthew and Jeanne are shown cleaning them and dumping them into color-coded barrels, that seems to be part of it as well. 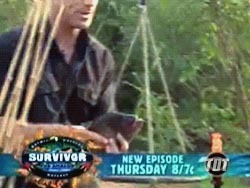 As for who wins, while the men look to have experience in both the fishing (Butch) and processing (Matthew) parts of this challenge, a case could be made for Jaburu as well. 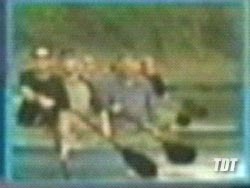 In Ep3, they seemed to be catching much larger (and seemingly more) fish than the "master fishermen" at Tambaqui (of course, the women had bait, and the men did not). 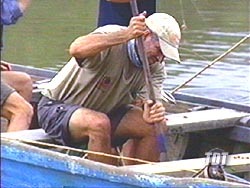 Probst also made a point to play up the men's lack of effort in the fishing department, totalling a measly one hour a day. On the other hand, since the title, "Trapped," looks to refer to Shawna's situation of wanting to quit but being unable to, an IC win for Jaburu here would undercut that theme. 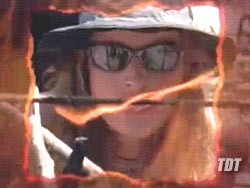 Instead of seeing Shawna complaining about having to stick it out for three more days, we'd be forced to go back to camp with Tambaqui, and watch them threatening to boot both Roger and Matthew. Whereas if Tambaqui wins, the stage lights will be shining bright for more drama back at Jaburu. We'll go with that for now. IC pictures: Click thumbnails above for larger versions. Pictures below are actual size, but feel free to click if you feel it's necessary. Tambaqui fishing away. Rob fussing with a fish. So has Heidi, for Jaburu. Smiles all around. Jeanne cleans, while Shawna sits out. JoAnna is looking vulnerable. For the Heidi-Jenna-Deena alliance to consider mercy booting Shawna, they have to be assured of a majority afterwards. They have two options: recruit Christy, or boot her or JoAnna. Booting JoAnna breaks up her alliance with Jeanne, but does risk invoking the wrath of God. Decisions, decisions. And if there's a dispute over chores at Jaburu, we expect that JoAnna won't hesitate to loudly voice her opinion on one side or the other, which will make her a target. We'll lean towards JoAnna for now, if only because ChillOne had her in the first four boots. Shawna's crying and lack of interest in continuing presents another attractive option. Seems a little too easy, though, and it depends on Jaburu losing an immunity challenge (and we see Shawna sitting out of one). We can see now how she goes pre-merge, but probably not this week. Alex is a possibility from the men's side. 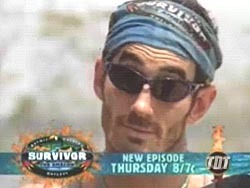 He was openly called "the best player" by Rob (to his face, at least), and Dave's mystification at Alex's universal appeal to the various Tambaqui factions was pointed out not once, but twice. Dave and/or Rob might be able to use that to plant seeds of doubt in Roger's mind. Since Roger and Alex have already had their differences of opinion, an Alex boot is not out of the question. Roger is of course another possibility. Matthew has to feel vulnerable with Ryan and Daniel gone, and his friendship with Daniel exposed at TC. He seems to have little patience for Roger, and needs Rob, Alex and maybe Dave to help. 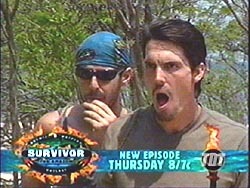 Seems like a tall order, but Dave didn't explicitly rule it out in Ep3, as long as Daniel went first.